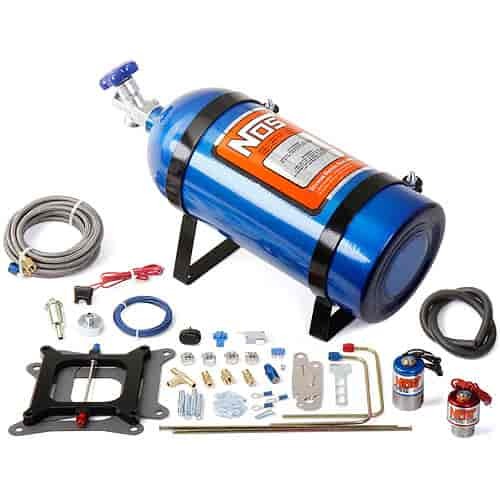 To supply the proper amount of fuel to the carburetor and Cheater System, a fuel pump must be used that is designed to operate between 5 and 10 PSI, with a flow rate of 0.1 gallons per hour / horsepower at 6 PSI. For example, an engine that produces 450 horsepower when the Cheater System is activated will require a fuel pump that flows at least 45 gallons per hour at 6 PSI. 02001 is rated 5.0 out of 5 by 1. Rated 5 out of 5 by Holliewood from cheater nos system Great buy. This is a fairly priced kit with great quality. You will need a 43 and a 57 jet to lower the cheater to 100 hp.